Having a good understanding of ground conditions is essential to safely setting up and operating outrigger enabled equipment. To better assist crews with assessing ground conditions, Pile Buck has published an excellent article detailing field investigation processes and proven methods to help crews better assess site conditions. 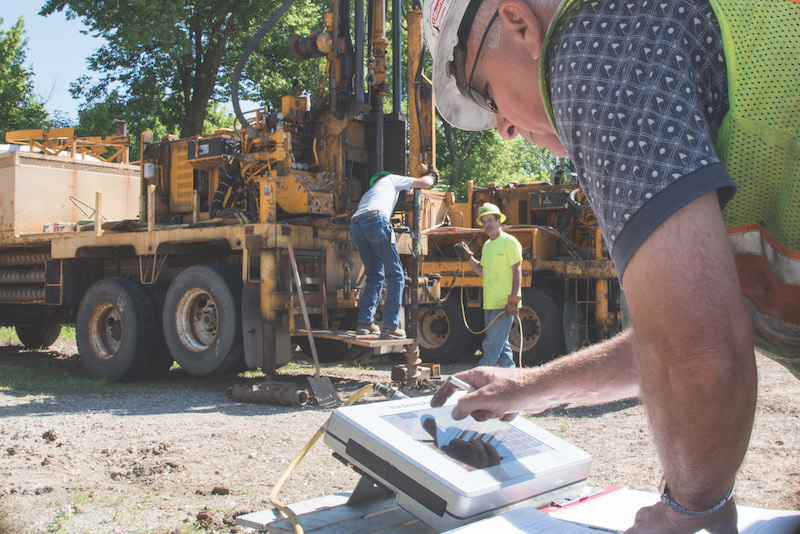 Photo courtesy of Pile Dynamics, Inc., Engineer performing Standard Penetration Test on construction site, 2018. As published on PileBuck.com November, 2018. 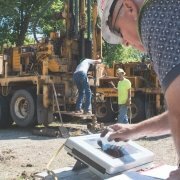 On site, In Situ Measurements provides crews information to help them make better decisions about the ground, and potentially the type and size of pads and matting they need. Spending a little extra time conducing a Standard Penetration Test (SPT), Cone Penetration Test (CPT), or simple Plate Load Test (PLT) can help identify any additional requirements to set up and operate safely. Additional requirements may include preparing the ground to increase the ground bearing capacity (GBC) by bringing in rock, removing soft surface layers or draining the site. Or, it could mean using larger pads or matting to reduce the ground bearing pressure (GBP) being applied to the ground. Today, the industry is facing increasingly stringent requirements for reduced and quantifiable ground bearing pressures under crane pads. Because DICA’s products are made from high performance materials, and are engineered for load distribution performance, DICA can provide detailed information about the interactions between the load, the pads, and the ground. A DICA FIT Assessment, gives customers different pad options that best align with their equipment and specific needs. Also, DICA offers several resources to support safe equipment set-up and operations. These include understanding the ground bearing capacity of different soil types and the relationship between pad area and ground bearing capacity. Click here to read the full article on field investigation processes and methods to asses site conditions at the Pile Buck website.